A new hope or a false dawn for the Airbus A380? Airbus bills its A380 as “the passengers’ favourite”. That’s the message on Airbus’s “I fly A380” marketing website devoted to the world’s largest passenger aircraft, which among other things features a wall of social media posts from scores of happy travellers. The popularity of the A380 among the flying public is also borne out in the numerous consumer surveys that have been conducted in the 11 years since Singapore Airlines (SIA) operated the first commercial flight in 2007. When pressed, passengers talk about the spaciousness, the wide aisles and the quietness of flight, not to mention – in the premium cabins at least – the innovations brought about by airlines having a big blank canvas to work with. Think vodka bars, onboard duty free shop and in-flight showers. While Airbus highlights the potential of two full-length decks to increase capacity into slot-constrained airports such as London Heathrow, aviation analysts see an aircraft that some airlines struggle to fill because of its sheer size. A look through the order book shows the caution with which airlines have approached the A380. Emirates Airline dominates with 101 aircraft in the fleet and 41 more on order. A large gap follows to the next-biggest operator SIA, which has 19 A380s in its fleet. Lufthansa is third with 14 aircraft, followed by British Airways and Qantas, who both have a dozen of the type. The passengers’ love for the aircraft has not quite translated into bumper sales, with the A380 program enduring an order drought that stretched through most of 2016 and 2017 broken only by Emirates topping up its existing order book in early January. However, the arrival of the first of SIA’s five new-build A380s in mid-December 2017 was regarded by those at Airbus as a cause for some cautious optimism. The five new A380s will replace SIA’s five oldest A380s in the fleet, which will remain at 19 aircraft. It was this significant investment that showed SIA’s commitment to the A380 and highlighted the aircraft’s utility in what is a competitive market, according to Airbus chief operating officer and Airbus Commercial Aircraft president Fabrice Bregier. “Today, if it is not a success with this fantastic delivery I don’t know what I can say,” Bregier told reporters at the arrival ceremony of SIA’s A380 9V-SKU in Singapore on December 14. “You have an airline, which is in a very competitive environment in Asia with many new long-haul carriers, including low-cost, and they decide to maintain the A380 in their fleet, to buy another five new, and to retrofit the old cabin. “They just don’t do it to please Airbus. While SIA plans to maintain its A380 fleet at 19 aircraft, there is likely to be fewer than 19 SIA A380s operating while the new aircraft are being delivered and older ones returned in the first half of 2018, as well as during the retrofit program of 14 existing A380s that will run from the middle of 2018 to 2020. Similarly, the retrofit program for 14 existing A380s will take place from the middle of 2018, once all five new-build aircraft have been delivered, and run until 2020. SIA chief executive Goh Choon Phong said the US$850 million price tag for the reconfiguration of the A380 cabins included the design, conceptualisation, certification and installation of the seats. The return on investment would come from being able to take advantage of market opportunities in the future. “In the first place we believe that we want to be able to continue to lead in terms of our product in the market and we want to also leverage this opportunity to bring new technology onto the aircraft so we can future proof,” Goh told reporters in Singapore at the arrival ceremony of 9V-SKU on December 14. “This is also precisely what our customers want in terms of more personalised space and so on and as you also realise as a result of that redesign and also the reconfiguration we are having a lot more seats and therefore revenue opportunities. “So from our perspective we believe that we will have a good case of realising that revenue opportunity. 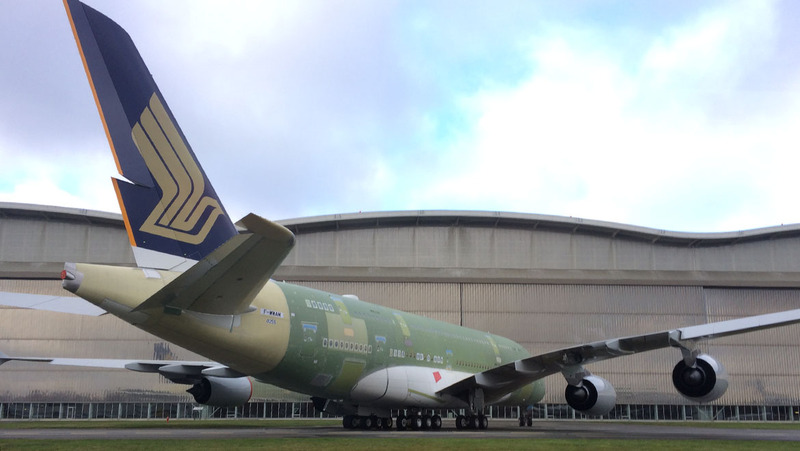 SIA retired its first A380 in November 2017, with 9V-SKA MSN003 stripped of its original livery and returned to lessors to be placed in storage in Tarbes, France. 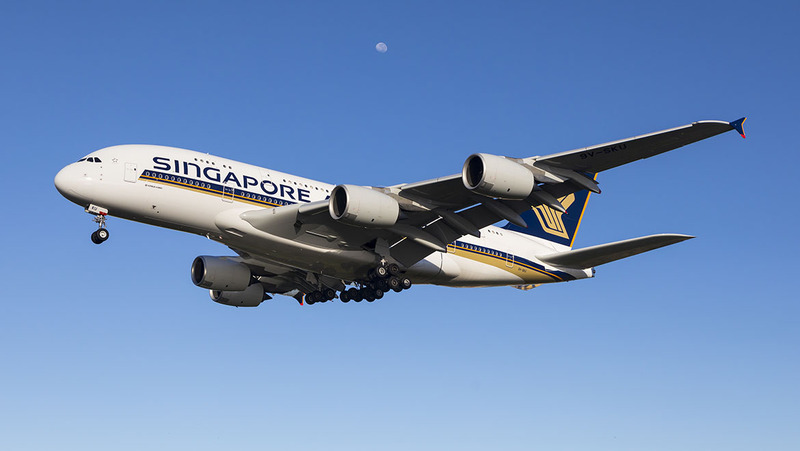 Meanwhile, the first A380 with the new cabin products commenced revenue service on December 18 and currently operates a daily Singapore-Sydney rotation. The next two destinations for the new-build A380 would be Hong Kong and London Heathrow, SIA said in January. Bregier said he “absolutely” expected more A380 airline customers to retrofit their A380s to take advantage of the latest trends in cabin layouts and seat technology. “It is clear the cabins have evolved dramatically. When you look at the new business class so if they want to maintain the attractiveness of the aircraft retrofit of the cabin is a must,” Bregier said. “Without giving you the name of an airline – it’s a European one – we had this discussion and the answer was ‘yes but we can’t retrofit it now because the aircraft is fully booked so we need the aircraft’. At the 2017 Paris Airshow, Airbus presented an updated version of the A380 featuring new winglets and other operational improvements packaged together as A380Plus designed to improve the aircraft’s operating economics and perhaps attract new orders for the program. Airbus said at the time the new winglets, measuring 4.7 metres in height (an uplet of 3.5m and a downlet of 1.2m), would help improve aerodynamics and reduce drag. The A380 wings’ overall dimensions would remain within an 80m x 80m envelope, maintaining the aircraft’s compatibility with airport infrastructure. Further, Airbus said the A380plus package also featured longer maintenance check intervals, including a reduced six-year check downtime, to help cut maintenance costs and increase the available flying hours of the aircraft. This was on top of previously announced “cabin enablers” to add up to 80 more seats in the cabin, such as an 11-abreast economy and nine-abreast premium economy on the lower deck, new stairs, the removal of sidewall stowage bins on the upper deck and a combined crew rest compartment. Airbus Commercial Aircraft head of A380 marketing Frank Vermeire said A380Plus was a “development study” with a proposed entry into service from 2020 onwards. However, some of the “cabin enablers” would already be seen on some airlines, such as SIA’s decision to do away with sidewall stowage bins on the upper deck for business class passengers. “There are certain what we call cabin enablers which you will see going into service in the next couple of years but the entire package is something which we look at putting into service in 2020,” Vermeire told reporters in Toulouse on December 12. There are also a number of potential new business models for the A380. One idea is for a low-cost-carrier to carry close to the aircraft’s certification limit of 868 passengers. Another is for the aircraft to be used on religious pilgrimage flights to Saudi Arabia, which is currently being trialled by Malaysia Airlines. And in November 2017 aircraft leasing company Amedeo floated the idea of operating A380 flights on behalf of other airlines or even companies from outside aviation using its own cabin crew and pilots. Bregier was keen to also talk up the potential of the Chinese carriers using the A380 in future years amid a surge in outbound travel from the country. “Why can’t you imagine that a Chinese airline, with the growth in the international traffic, could not do the same with a new hub in a new Beijing airport,” Bregier said. “It’s a matter of daring and I believe that many airlines are looking for the easy path, which is why I reduce my risks, but I reduce my reward as well. “We have to convince them that the level of risk to operate a big fleet of A380s is lower than what they have in mind and the reward is higher. He described the A380 program as in a transition phase. “This is not very easy but I am sure in a few years we will have additional orders, additional customers and we will be in a better position to retrofit it – it is still a young aircraft – to optimise it and make it even better,” Bregier said. Bregier did not have to wait long. 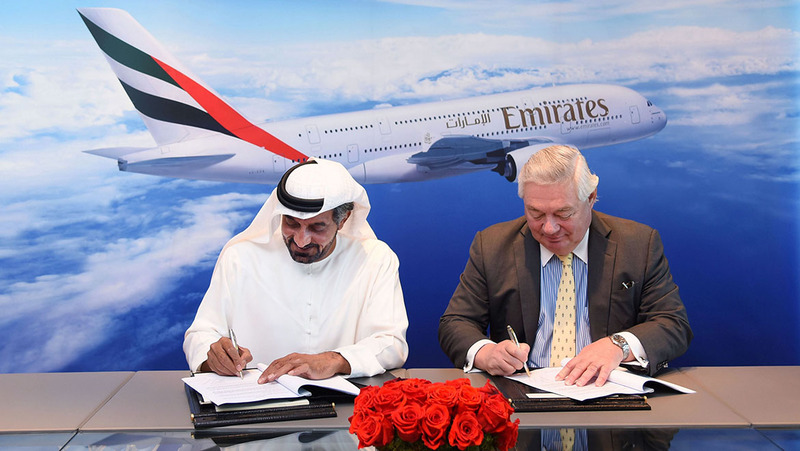 On January 18, Emirates signed a memorandum of understanding (MoU) that included a firm order to purchase 20 A380s and options for 16 more. The aircraft will be delivered from 2020. The deal ended a 21-month period without any A380 orders and offered the program a significant boost just three days after a senior Airbus official publicly canvassed the possibility of shutting down the A380 production line should Emirates, the world’s biggest customer of the type with close to half the total order book, not order any more A380s. 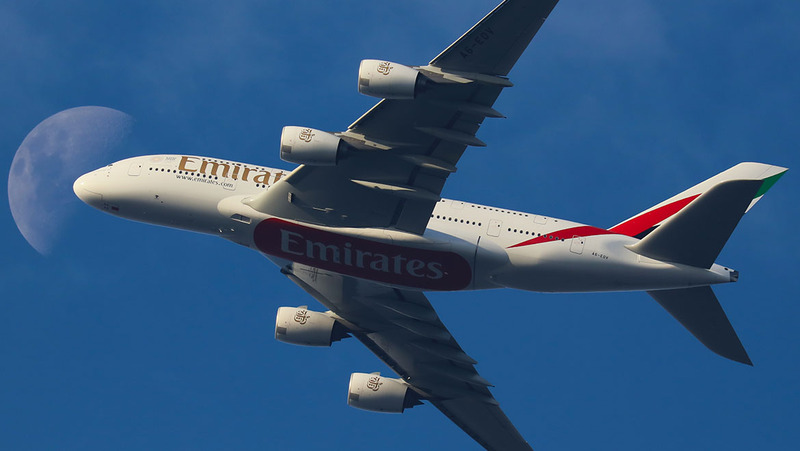 Emirates chairman and chief executive Sheikh Ahmed bin Saeed Al Maktoum conceded as much when he said the order would “provide stability to the A380 production line”. Further, Sheikh Ahmed said Emirates would continue to work closely with Airbus to “further enhance the aircraft and onboard product”. It has been reported that the Dubai-headquartered carrier has been pushing for updated engines to improve the aircraft’s fuel efficiency and operating economics. Days earlier, at Airbus’s 2017 orders and deliveries announcement on January 15, Bregier acknowledged there was a commercial challenge around the A380, noting an internal analysis of the program’s supply chain determined that there needed to be a “minimum of six aircraft a year to maintain industrially an efficient production line”. “I can confirm today that we can have an industrially robust process to deliver down to six aircraft a year,” Bregier said. Airbus planned to slow the production rate of the A380 from 15 aircraft delivered in 2017 to a projected 12 aircraft in 2018 and just eight in 2019. Before the new Emirates commitment the A380 order book stood at 317 at the end of December, with 222 aircraft delivered and a backlog of 95. In one of his first comments since taking over from John Leahy the manufacturer’s chief salesman, Airbus Commercial Aircraft executive vice president and chief of sales, marketing and contracts Eric Schulz said there were still airlines out there looking at the A380. “I was talking to a couple of customers who are still interested on the A380,” Schulz told reporters at the Singapore Airshow on February 6. “I believe that the door will continue to be open on some very specific markets where growth is a big issue with restricted airspace, restricted airports. I think we will continue to have some opportunities. Schulz said the order from Emirates was very important for the program. “That order from Emirates will absolutely stabilise the A380 production,” Schulz said. Under the new configuration, SIA will have 471 seats on its A380s, comprising six suites in first, 78 in business, 44 in premium economy and 343 in economy. Suites is being moved to the upper deck alongside business class, while premium economy and economy will stretch out across the entire lower deck. This represents a capacity increase of between seven per cent and 24 per cent from SIA’s two A380 configurations currently flying. These feature either 379 seats (12 suites, 86 business, 36 premium economy and 245 economy) or 441 seats (12 suites, 60 business, 36 premium economy and 333 economy). SIA executive vice president for commercial Mak Swee Wah said the reconfiguration program reflected changing market demand and the rise of the premium leisure passenger willing to fork out extra dollars for more comfort. “The A380 is already 10 years in operation so we look at the market, we look at the demand and we’ve got a bit of data,” Mak told reporters at Airbus headquarters in Toulouse, France on December 12. Mak said SIA had no plans to grow its A380 fleet beyond 19 aircraft, believing it was the right number for its route network. And despite some conjecture about the viability of the A380 program amid a dearth of new orders, Mak expressed confidence in the aircraft. “Fleet development is an ongoing thing but as far as we can see now, for the forseeable future for the kind of markets that fits that particular mission, we need the A380,” Mak said. Singapore Airlines crew at the delivery ceremony for 9K-SKU. Airbus executive vice president for sales and marketing Kiran Rao said SIA was a strong partner of the A380. 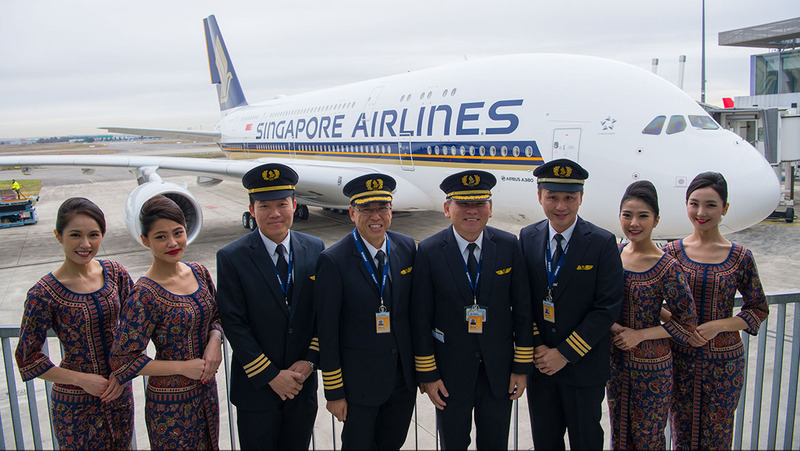 “The most important aircraft type that we have placed with Singapore Airlines is the A380,” Dr Rao told reporters just before 9V-SKU took off on its delivery flight from Toulouse to Singapore on December 13. Airbus will no doubt be hoping the A380’s second decade represents something of a new dawn for the double decker superjumbo. This feature story first appeared in the March 2018 issue of Australian Aviation.